Groundhog Day infographic: No Shadow? Not Likely. Groundhog Day Infographic, Parody Video: Is it Spring Yet? Groundhog Day infographic and parody video — just in time for the goofiest holiday of the year. aNewDomain.net — It’s Groundhog Day. 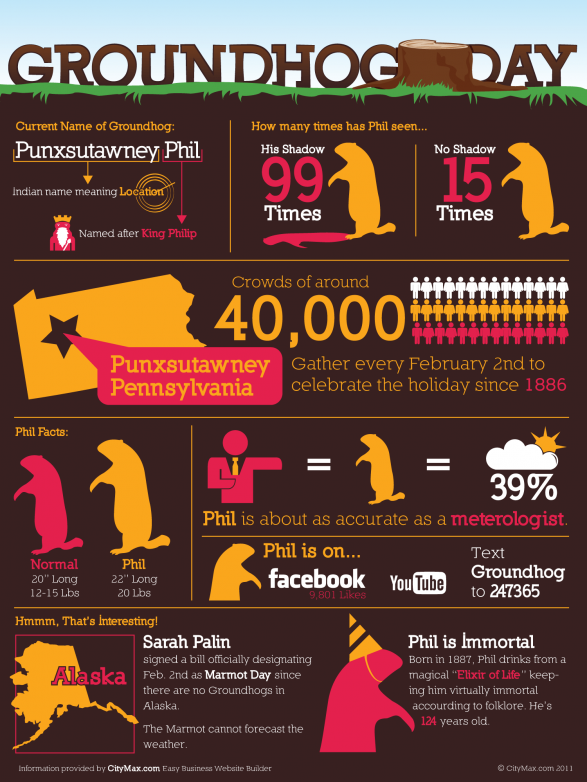 Check out this Groundhog Day infographic — it’s full of Groundhog Day facts and bizarre triviata. Did you know Punxsutawney is a native American word for “location.” And yes, it’s also a village in Pennsylvania. Where’s the Phil from? Why, Prince Philip, of course. Scroll below the fold to check out a Groundhog Day prank video. Too funny. While you’re watching, check out this great post with six hard-to-believe Groundhog Day facts. Inspiring.